We’d love your help. 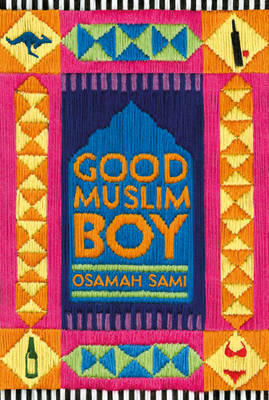 Let us know what’s wrong with this preview of Good Muslim Boy by Osamah Sami. By the age of thirteen, Osamah had survived the Iran–Iraq war, peddled fireworks and chewing gum on the Iranian black market, proposed 'temporary marriage' not onc Meet Osamah Sami: a schemer, a dreamer and a madcap antihero of spectacular proportions whose terrible life choices keep leading to cataclysmic consequences … despite his best laid plans to be a Good Muslim Boy. And the trouble didn’t stop when Osamah emigrated to Australia. As much as he tried to be a Good Muslim Boy – his father was the lead cleric in Melbourne, after all – life was short and there were beaches with girls in bikinis to skip school for, a medical degree to fake because the son of a cleric should become a doctor, and an arranged marriage to run away from because his heart belonged to someone else. To ask other readers questions about Good Muslim Boy, please sign up. The reader gains an insight into the everyday lives for those living in Iran and then travels with the family as they start their new life in Australia. My favourite sections are when Osamah recalls the interactions between himself and his teacher when learning English at school. Language barriers, family expectations and arranged marriages are revealed alongside the joys of supermarkets stocking plentiful food and no queues, television that shows sports continually and most importantly, Osamah’s discovery of scantily clad girls on hot Australian beaches. Badly thought out mischievous exploits and attempts to continually please his family and adhere to societal and religious rules sees Osamah continually dig himself deeper and deeper into trouble. These adventures had me laughing out laugh however it is the sincere and poignant words that he has chosen that reveal the constant enduring love that Osamah has for his father. These are the parts that made me cry. A beautifully written memoir and a wonderful reminder of the diversity and backgrounds of our newly arrived Australians. A book for everyone! This is an excellent book, and skillfully crafted. I would highly recommend to anyone with a sense of justice and humanity. A very humorous and funny read but also moving, sad and poignant at the same time. Cannot recommend this enough. This memoir was recommended to me by a colleague, and although I didn’t doubt that it was going to be a good read, it ended up completely blowing me away. Sami’s writing is both beautiful and accessible, and he somehow makes his stories simultaneously emotional and hilarious. While reading a chapter about the death of someone (I won’t say who!) I was moving between laughing out loud at wisecracks, and falling dead silent with morose at other turns of phrase. It was such a weird mix… weird and wo This memoir was recommended to me by a colleague, and although I didn’t doubt that it was going to be a good read, it ended up completely blowing me away. Sami’s writing is both beautiful and accessible, and he somehow makes his stories simultaneously emotional and hilarious. While reading a chapter about the death of someone (I won’t say who!) I was moving between laughing out loud at wisecracks, and falling dead silent with morose at other turns of phrase. It was such a weird mix… weird and wonderful! After just a few pages, I became completely enthralled in the narrative, and sped through the entire book in a day. The plot of Good Muslim Boy moves between Sami’s life as a young Iraqi boy living in Iran, and his present life in Australia (while most of this part of the book is actually set during a trip he takes back to Iran). This contrast works really well, and the two storylines are equally as strong and engaging. The chapters were short and the whole book flowed flawlessly. The ending is so perfect that I couldn’t help my eyes from welling up (which was embarrassing because I was at work). I finished this book feeling elated, and perhaps some of that came from the fact that I wasn’t expecting this to be such an incredible story. I truly couldn’t fault it. A well-written, funny and moving memoir, Good Muslim Boy is a must-read. Five stars from me! Fantastic read. Tragicomic and touching. A remarkable memoir of a ballsy "half-Iraqi, half-Iranian, half-Aussie" "Moozlem", that encompasses a childhood blighted by the Iran-Iraq war, several "temporary marriage" proposals, a random spate of doorknockings across Iran in the hope of meeting girls wearing red, an unlicensed fireworks business, a fake medical degree and an arranged marriage that lasts less than a day because the groom makes a run for it from the wedding limo outside a 7-11. Sami skilfully interweaves dual storylines - a ch A remarkable memoir of a ballsy "half-Iraqi, half-Iranian, half-Aussie" "Moozlem", that encompasses a childhood blighted by the Iran-Iraq war, several "temporary marriage" proposals, a random spate of doorknockings across Iran in the hope of meeting girls wearing red, an unlicensed fireworks business, a fake medical degree and an arranged marriage that lasts less than a day because the groom makes a run for it from the wedding limo outside a 7-11. Sami skilfully interweaves dual storylines - a childhood arc of flight from Iran to Melbourne, a return trip to Iran as an adult with his revered Muslim cleric father - that are marked by acts of violence, acts of strangeness and acts of kindness. Certain scenes from the adult storyline standout sharply: a bus load of Kurds and Iranians standing up for Arab, Iraqi-by-heritage Sami when a group of soldiers storm his bus and threaten to haul him off at gunpoint for being an illegal; the homeless Iranian woman sheltering in an alley with three small children that Sami passes a few wintry hours with when he has nowhere else to go; Sami being deported from America by Homeland Security for wanting to enter the country to perform "Saddam: The Musical" with his theatre troop in Detroit; Sami bawling on the office floor of a cargo clerk in Mashhad, Iran when he is finally allowed to take his father home to Australia. Globally, we are suffering a crisis of empathy. Reading "Good Muslim Boy" gave me insight into the Iran-Iraq conflict beyond the clipped news stories we were treated to in the West, and a greater understanding of the cultural and religious differences that affect the region. While we don't share a similar cultural background or history, the weight of expectation on Sami to do well at school and make a good marriage, to be a good person and not bring shame to the family and community, were struggles any migrant will identify with. Read this book after watching the film "A Muslim's Wedding" which is based on the last third of this amusing memoir. The scenes of a musical comedy written by a Shiite cleric satirising Saddam Hussein and the later arrest of the theatre company as they enter the US are so crazy they couldn't be true. But they are. Sami describes in Iran then later in Australia. His energy, smart comments and adventures are fodder for more films. Interspersed with his life story are chapters that cover a visit to Read this book after watching the film "A Muslim's Wedding" which is based on the last third of this amusing memoir. The scenes of a musical comedy written by a Shiite cleric satirising Saddam Hussein and the later arrest of the theatre company as they enter the US are so crazy they couldn't be true. But they are. Interspersed with his life story are chapters that cover a visit to Iran in 2013 which went very wrong. His father dies and Sami has to confront his emotions and government bureaucracy. I'll never complain again when my travel plans go astray. This was a welcome surprise. The book came onto my radar before I knew it was being turned into a feature film (which I have not yet seen), and I was a little surprised to discover the film being promoted as a Muslim rom-com. The book is not that, although it does contain a little rom and quite a bit of com. Osamah's childhood in Iran was coloured by his not quite belonging. Although he was born there, his parents were Iraqi, and in the 80s that made him the enemy. He was the Arab amongst the Per This was a welcome surprise. The book came onto my radar before I knew it was being turned into a feature film (which I have not yet seen), and I was a little surprised to discover the film being promoted as a Muslim rom-com. The book is not that, although it does contain a little rom and quite a bit of com. Osamah's childhood in Iran was coloured by his not quite belonging. Although he was born there, his parents were Iraqi, and in the 80s that made him the enemy. He was the Arab amongst the Persians at school, with older male relatives - including his Shiite cleric father - fighting on either side of the war. Osamah had to try extra hard to fit in. When his family was accepted into Australia under the refugee program, his life became physically safer, but he still had to work hard at fitting in and reconciling his religious beliefs/learnings with his new shiny, free, tempting Australian life - listening to music, relaxing at the beach, being able to see women's hair, and so on. He had to deal with parental expectations of becoming a doctor when all he really wanted to be was an actor. Also being the eldest son of a highly respected cleric added a burden of moral responsibility within the Melbourne Muslim community. I just finished reading this extraordinary book – what a story. I couldn't believe I was laughing so hard in one minute and sitting in absolute shock the next. The stories are so human and beautifully written, and the main narrative is heartbreaking, moving and at times hilarious - which is what the author does so masterfully. Recommend this to every reader that loves a universal tale and great literature. Simply amazing. This is an great and enjoyable book. Loved it. It's the kind of book you read with your mouth open amazed that it's all true. You’ll never know whether to laugh or cry but it’s guaranteed to move you. You must read or listen it. Marvellous. Insightful. A delightful autobiography by an Iranian migrant to Melbourne, Australia. Sami brings his experiences across not as ham-fisted and obnoxiously left-wing, but rather with wisdom, compassion and a great sense of humour. I found this book equally as hilarious as it was touching. It really makes one appreciate the fascinating culture from which he came, without having it forced rightously down you throat. I would highly reccomend this. Entertaining and insightful window into a world so different from my own. I wanted to love this but was irked by some of the irresponsibility. Interesting to learn more of Muslim culture though. An irreverent, wickedly humorous memoir that subtly laughs at Aussies, Iranians, Iraqis, Kurds, Christians, Muslims and everyone in between, and who better to do it than Osamah Sami. Born in Iraq, raised in Iran, then emigrated to Australia, Osamah's life is a series of madcap adventures, interspersed with moments of pathos when he describes his relationship with his father and their final trip back to Iran. I didn't realise until I finished this that it was the basis for Ali's Wedding, which of course I have not seen yet. Clearly, the film is based on the book's B Plot, as the A plot: a madcap epic struggle between one grieving youth and unyielding bureaucracy, does not make a great film pitch. It makes one hell of a yarn, though, in the best tradition of tellers of tall tales* everywhere. Sami infuses his story the tone of a Charlie Chaplin movie (or possibly a Pezeshkzad work), with the reader br I didn't realise until I finished this that it was the basis for Ali's Wedding, which of course I have not seen yet. Clearly, the film is based on the book's B Plot, as the A plot: a madcap epic struggle between one grieving youth and unyielding bureaucracy, does not make a great film pitch. It makes one hell of a yarn, though, in the best tradition of tellers of tall tales* everywhere. Sami infuses his story the tone of a Charlie Chaplin movie (or possibly a Pezeshkzad work), with the reader breathing every element of the tension while the absurdity ratchets up and the quips come ever faster, so that when the pathos breaks it hits all the harder. Based on that description, you'd think I'd like this a lot. But the style tends to get on my nerves (tbh, I always wanted to enjoy Chaplin more than I did). It is a kind of humour that seems to deter too much empathy, even as it builds bridges of understanding. The end did give a strong pay-off, as it pulls the A plot and the B plot together in an emotional whammy which makes you realise what the book was really about all along. And really, it is a story about a universal. Many of the recent books by first and second generation Australian migrants I've read recently emphasise the elements of their experience which are forced out of the mainstream narrative, books that challenge relatively privileged readers to listen, and seek to build connections and visibility for others. Sami, however, is telling a story where commonality, the universal experience of fathers and sons, is the punchline. The book explores racism, the brutality of the Iran/Iraq war, the refugee experience, Islam, post 9/11 heights of Islamaphobia, but refers back to the commonality of human experiences for its strongest themes: of family, growing up, love and, of course, struggling with bureaucracy. I had this book sitting around at home for about 6 months (shame on me for hogging it, thems the perks of working in a library). I read the ‘lunch with....’ Osamah Sami the other weekend and that prompted me to read it (and get a ticket to the stage play at the Malthouse). This was such a fantastic memoir - I devoured it! The machinations he had to go through when his father died unexpectedly while they were back in Iran made our experience when Mum died seamless and trouble free. This was a great book and I loved the way he incorporated humour into his writing even when he went through difficult times. Amazing stories and I highly recommend. So honest and human and beautiful. I've finally read this amazing book, it took me forever but I have been meaning to read it for so long and had never gotten round to it but now I have. It was so worth it. Osamah Sami is so funny, I was constantly laughing even as he wrote about his childhood in war torn Iran. But he also wrote in a way that was really emotional and heartfelt. I cried at the end. He wrote beautifully with honesty, heartbreak and humour. Everyone should read this book! This review has been hidden because it contains spoilers. To view it, click here. After the first section which did not grab me, I was caught in such a way, as to read ahead of doing chores that now need to be done. To give an insight to a world so far from mine, and to help understand why how I dress may cause a response those of my close group would not show, this book is good. The story woven through the pages, of his father' sedat hand the challenges faced in getting out of a country before the visa terminates, is astounding. It makes me happy to live in our bureaucracy, After the first section which did not grab me, I was caught in such a way, as to read ahead of doing chores that now need to be done. To give an insight to a world so far from mine, and to help understand why how I dress may cause a response those of my close group would not show, this book is good. The story woven through the pages, of his father' sedat hand the challenges faced in getting out of a country before the visa terminates, is astounding. It makes me happy to live in our bureaucracy, even when I find it frustrating. I think the sense of order here in comparison is something I am very thankful for. A really humorous yet dark read. Don't judge a book by its cover? This is an exeption. As original, creative and beautiful on the outside, it is within. Written so passionately by Osamah Sami, Good Muslim Boy is A must read. Recommend it to anyone. What a simple but beautiful story, full of love, humour, compassion and all other human values. Inner conflict of a migrant and amazing efforts to settle in an entirely new environment yet maintain your identity - probably a confused identity- ready for infusion! Wow! What a thoroughly enjoyable book. I read this in a day - that’s how good this book is. Highly recommend!! I just finished Good Muslim Boy this morning, it was really funny and endearing. The best read I've had so far this year. Can't wait for more from this author.